Fred Parhad is a self-taught sculptor with over 35 years of professional dedication to his work. He began his journey with the choice to turn away from conventional art classes at UC Berkeley, and pursue a life in the arts. Searching for a path of his own, Fred challenged himself to learn by doing. His work is grounded in an abiding interest in the human condition. He spent three years working with Seattle’s juvenile justice system, at the time being the youngest person to receive a license and grant from the Federal Law and Justice Program to open his own in-home treatment center, and later to strand himself and his wards on a deserted island; Where, through life’s basic struggles, they learned how very capable they were in the business of caring for themselves and in time, for each other. In 1976, Fred took his son and moved to New York City, determined to dedicate his life to sculpting. Over the next four years, Fred worked in foundries, learning the techniques and traditions of a craft well over five thousand years old. Eager to study from the best instructors history had to offer, he headed to the Metropolitan Museum of Art to soak in their classical works. He received special permission from the administration to bring clay into the gallery and practice, each night after work, he would work alongside these ancient Masters. 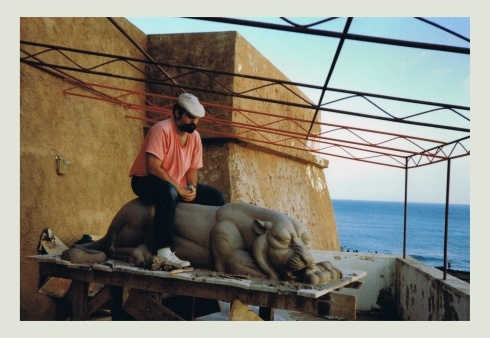 Beginning in 1978, from his studio in the hills of Napa valley, Fred completed a considerable collection of classic Assyrian sculptures, simultaneously exhibiting them around the country. During this time, Fred created the Ashurbanipal monument, the first Assyrian public monument anywhere in the world in the last 2500 years; it stands in San Francisco in front of the Asian Art Museum. Along the way, Fred found the greatest thrill and challenge came when making portraits: “If you're lucky you not only capture a ’likeness’ but what lies behind it. You have only one moment, one pose, one expression, to say something about your subject, and in turn yourself.” In an era capable of producing an exact replica of any person, Fred is not striving for likeness, but his take on it.